Systole-box, a pinch of Farfisa, Mopho and Yamaha RX 15.
and a lot of audio hand-cooking. Cover installation and photo by Patrice Le Garrec. Saxophonist Matthieu Metzger likes going beyond the traditional techniques associated with his instrument, notably thanks to his passion for electronic treatments – he's been designing real time transformation music software since he was a kid. 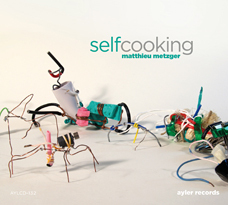 Some of these compositions lurked in Matthieu's memory or his shelves, others were specially written for this occasion – the strange and exciting experience of planning an album. With no unity to justify, no tragic concept. As a matter of fact, it was all about the pleasure of cooking for you something abstract and joyful.